MID-WILSHIRE: When did everything start feeling like a bleak scene from "It's a Wonderful Life?" A foreclosure sign has gone up at 7950 Wilshire, site of the famous Welton Becket-designed "House of Tomorrow." And there's no guarantee that the place won't be torn down. LOS ANGELES: Like a t-shirt being thrown in a dryer, Los Angeles gets mighty shrunk in the “Midnight Club" Video. It was quickly revealed that some people prefer this very abbreviated version of Los Angeles. SHERMAN OAKS: So far, it’s been a lot of tree-lined streets making the list of lovely roads. Up this week; A stretch of Chandler Blvd between Ethel Avenue and Tyrone Avenue. SOUTH LA: A trip to Kanner Architects futuristic United Oil station/car wash at the corner of Slauson and La Brea avenues revealed that work may very well be nearly done. WEST HOLLYWOOD: It was one of the bigger PriceChops to date. A unit at Sierra Bonita came to market listed at $955,000 in May and it's now down to $499,999. Still too expensive, claimed readers. 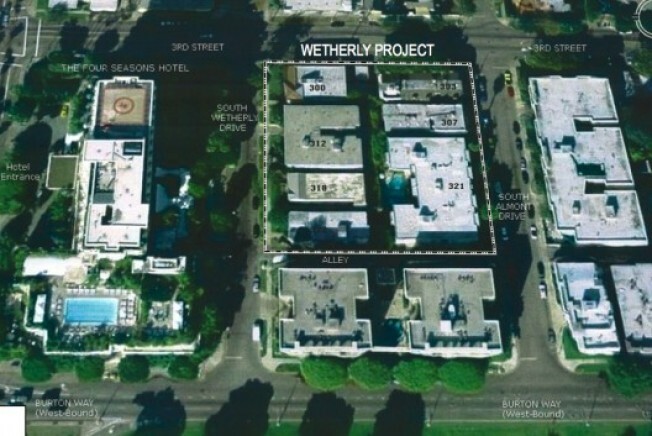 LOS ANGELES: If built, a very large development planned right near the Four Seasons Hotel may very well take out your residence. All the renderings and details here.